The Warner College of Dairy Technology is dedicated to academic excellence in Undergraduate, Postgraduate education and Research programmes across a broad spectrum of disciplines in Dairy Education since 1924. Moreover, Dairy Education and research have gained distinct momentum in the last few decades. 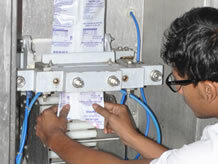 Degree programmes in Dairy Technology have drawn a prime attention after College education having science background. Research scholars and Scientists are also becoming more interested in the areas of Dairy Technology education and research. Furthermore, the students are acquainted with various facts of professionally managed industries, which include production management, raw material purchase, and personnel management, sales and marketing by virtue of Industrial In-plant training. This helps students to get faith and confidence to work as highly professional human resource for food industry. The College has different departments, which not only help in the smooth functioning of the academic activities but also provide the growing technocrats with the expertise guidance and the latest laboratory facilities for their technical upliftment and development of professional traits.